Matthew 24:37-38 "As the days of Noah were, so shall also the coming of the Son of man be"
This week's lesson is intended to show how God in his mercy, just as in the days of Noah, gives mankind as much time as possible to repent. It is also intended to show that God gives instructions to the righteous that if followed will provide the righteous Saints sanctuary from the ever-increasing waves of wickedness in the world. "The season of the world before us will be like no other in the history of mankind. Satan has and will unleash every evil, every scheme, every blatant vile perversion ever known to man in any generation. Just as this dispensation is the fullness of times, so it is also the dispensation of the fullness of evil. We and our wives and husbands, our children, and our members must find safety. There is no safety in the world; wealth cannot provide it, enforcement agencies cannot assure it, membership alone in this Church will not guarantee it." In our last study we learned of Enoch. Enoch and his city were so righteous that they were removed from the earth and taken into heaven. However Enoch's son, Methuselah, was not taken. Why was Methuselah left behind? Moses 8:1-2. As part of the covenant the Lord made with Enoch, He promised Enoch that his seed would run through Noah's line and thus his seed would be preserved. And so Methuselah needed to remain on earth to produce and raise that seed. Now, as it was, his son Lamech already was born so why do you think it was important for Methuselah to stay behind still? How did his presence help fulfill the covenant? I wonder if he was there to be a guiding influence in the life of his grandson or whether as the "youngest" in the family line with the office of high priest he was needed so as to be able to ordain Noah to that office? Either way it must have been a somewhat lonely task I would imagine after seeing the faithful city of Zion and all your strength and friendships removed. Imagine seeing your local ward or stake being translated and you are left to yourself on earth, just you and your family. Would you be strong enough to resist the evils of the world and guide your family? How strong would you need to be? What a great man Methuselah must have been. Now to give you an idea of the timeline - according to Genesis 5. Noah was born just 4 years after the city of Enoch was taken from the earth and 126 years after Adam died and was likely part of the first or second generation not to have personally known father Adam or be ordained by him (see list of ordinations Doctrine and Covenants 107:41-57). "Let no one, upon comparing the lives of the ancients with our lives, and with the few years which we now live, think that what we have said of them is false;...for those ancients were beloved of God...and because their food was then fitter for the promulgation of life...and besides, God afforded them a longer time of life on account of their virtue and the good use they made of it in astronomical and geometrical discoveries...Now I have for witnesses to what I have said all those that have written Antiquities...that the ancients lived a thousand years"
Whatever the reason for their longevity, many records do bear witness of their longevity. Be that as it may, essentially 1099 yrs passed between creation and Noah as recorded in the bible. What had been accomplished in that first 1000 years? Mankind had multiplied as commanded and started to divide as is the eternal order of things to create opposites thus creating choice and therefore growth. Establishment of a righteous people v establishment of a wicked people. But in taking Zion into heaven the balance on earth had shifted towards wickedness. What do we know about Noah before the flood? Noah was ordained to the priesthood at just 10 yrs of age by Methuselah who had been ordained to the priesthood by Adam when he (Methuselah was 100 yrs old). What does this suggest about Noah? Noah's name means Rest or Comfort (see Moses 8:9; Genesis 5:29) What does this suggest about how Methuselah and Lamech had found the work since Zion had left the earth? Noah and his sons were called the sons of God as they hearkened unto God and were given His Holy Priesthood (Moses 8:13,19). Noah was almost killed by giants but the Lord protected him and saved him by his power (Moses 8:18) Who were these giants? Noah was considered a just man and perfect in his generation and walked with God and found grace in the eyes of the Lord (Moses 8:27) What does it mean to be perfect in his generation? Are there different perfections for different generations? I think this maybe the second definition of perfection. He wasn't perfect as in without sin for all man sins. But he was perfect as in complete, whole, or with integrity throughout his whole life. Noah holds the keys to a dispensation and stands next to Adam in authority (see LDS BD Noah). As Adam symbolizes newborn man, so Noah symbolizes reborn man. Nicodemus asked Christ how it was possible that man could be born a second time despite having it right there in the scriptures. If Nicodemus had looked closer at his scriptures what Christ taught him should have made a lot of sense. Mankind was reborn through Noah and in that sense Noah is very much a type of Christ. Noah is also known as the angel Gabriel, who visited Daniel, Mary, and Zacharias. What was going on in the world as Noah preached? Others claimed to be priesthood holders and claimed to be sons of God but did not listen to God and were thus became known as sons of men. How did they try to justify themselves? (Moses 8:21) "We got married, we multiplied, our kids are big and strong - see! we are righteous!" "BUT they hearkened not unto the words of Noah". How might we be in danger of being like these people? Daughters of God also marrying unrighteous men. How is today's world similar? How close do you think we are to the times spoken of in Matthew and Luke when it will be as in the times of Noah? What ultimatum did the Lord give, (remembering he has been laboring with these people since the time of Enoch)? Moses 8:17 God gives the people another 120 years to repent. How merciful is the Lord? Genesis 7:6 also indicates that the Lord only gave the 120 year ultimatum after he had already given them 484 years previously, to repent (since Enoch and Zion were taken from the earth). There had been wickedness on the earth before. Why was this so different that the entire earth needed to be flooded and all life killed? What do you think was the last straw for God? The scriptures are too general for us to tell but certainly a theme was that God and the prophets were no longer listened to, the world had become a world of violence, and man chose evil over good continually. Even the children of the righteous were turning to evil it seems. Did you notice who made it into the ark? Genesis 7:13 Where were Noah's grandchildren or his other children? What commandments have we been given that might appear foolish to others? How many of us have a years supply food storage for the whole family? The ark was sealed within and covered without with pitch. The Hebrew word for this pitch was "kopher" which literally means covering. What do we have today that seals us and completely covers us and if used fully can prevent us from being engulfed in the waters of wickedness? The Atonement of Jesus Christ provides that sealing and covering effect in our lives. The ark was given three levels/stories symbolic of Solomon's temple that had three rooms representing the three kingdoms, or the three degrees of glory. "Endowed faithful members of the Church who keep all their covenants including the sacred coverings will be safe as [if they were] protected behind temple walls. The covenants and ordinances are filled with faith as a living fire. " "Before the Savior comes the world will darken. There will come a time when even the elect will begin to lose hope if they do not come to the temples. The world will be so filled with evil that the righteous will only feel secure through their faith in Christ and within the temple walls. 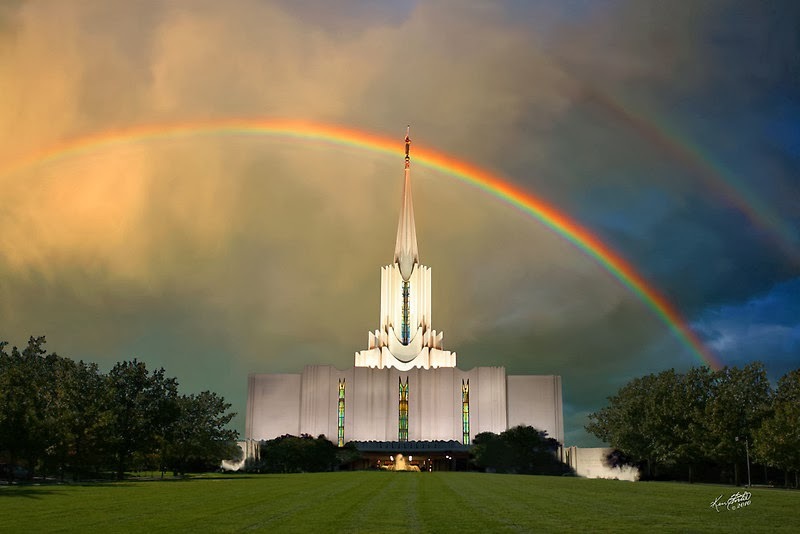 I believe the Saints will come to the temples not only to do vicarious work but to find a God-given haven of peace. The true and faithful Latter-day Saints will long to bring their children to our temples for safety's sake." What are we doing to become more temple-attending people/families/individuals? How does the temple and the covenants and ordinances within, strengthen us and cover us against the world? How can we make our homes more water tight? v.11 source of flooding: "fountains of the great deep broken up", "windows of heaven were opened"
v.14 earth dried 27th day of second month of 601st year. We know God to be a God of Love. Yet here a whole world is wiped out, slaughtered. How does this measure up to the God of Love that we all know and identify with? "I will go back to show you how the Lord operates. He destroyed a whole world at one time save a few...And why? This people were not only very wicked themselves, but having the power to propagate their species, they transmitted their unrighteous natures and desires to their children, and brought them up to indulge in their own wicked practices. And the spirits that dwelt in the eternal worlds knew this...And supposing ourselves to be of the number of unborn spirits, would it not be fair to presume that we would appeal to the Lord, crying...'Is it just that we who are now pure should take of such bodies?'" It is contrary to the plan to allow us to come into a world where it is so wicked that there is essentially a lack of choice. It would have been unfair to the unborn spirits to send them into that environment and ask them to choose good when there was no good to choose from. Thus we see it was in fact an act of mercy and love and justice and it was vital to the plan of salvation. Noah's family Ark experience is an entire year! Why did they wait so long to leave the ark? Why did they wait another month after they saw the surface of the earth was dry, for the earth to be completely dry? What did Noah do after he left the ark? JST Genesis 9:4-6 made sacrifices, gave thanks, rejoiced. Was it a global flood? Many Christians are now suggesting this was a localized flood (as there is very little scientific evidence of a global flood) but based on the spiritual symbolism of baptism by immersion I remain of the disposition that this was indeed a flood that covered the entire earth. "The flood had a far greater purpose than to merely to wipe out Noah's neighbours. God baptized the earth. He would not baptize a portion of it any more than we would be satisfied with a partial immersion if we were baptizing some person"
"...this earth was born in water. Before the land appeared the whole sphere was covered with water. [Then, with the flood of Noah, it was born again]." However rather than getting hung up on the physical aspects of the flood I believe it is far more important for us to learn from and focus on the spiritual lessons of the flood. Genesis 6:18 "with thee will I establish my covenant" What is His covenant? It is his "everlasting covenant" - the same covenant he made with all the prophets, with Adam and with Enoch and later with Abraham and that we know now as the Abrahamic covenant. 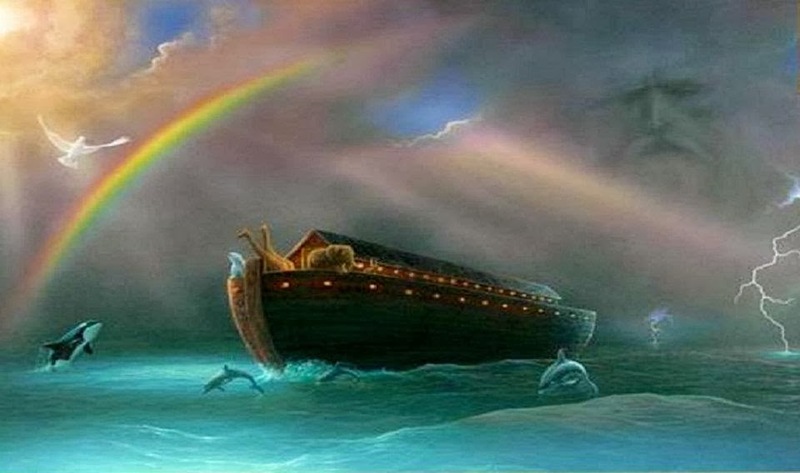 It would appear that the rainbow may also have been a symbol of this covenant before Noah. Earth might never more be covered by the floods. The rainbow was established as the symbol/token of this covenant. Covenants are two-way binding agreements. There is no doubt that Enoch and Noah's part in this covenant included keeping the commandments. The two main commandments the Lord reminded Noah of immediately after the flood was not to kill and to be fruitful and multiply. Why is God so insistent on us multiplying, to the point that he commands it? Having seed is one of the great blessings of mortality AND eternity. It is the central unit not only of mortal society but immortal society also. And those that are unable to have seed in this life, if they remain faithful to the commandments will have seed in the eternities. One of the great blessings of this covenant was also based around Enoch and Noah's posterity/seed. When you look at the animals brought onto the ark the message there too is not just about survival but also multiplying each species They were brought in two by two, male and female obviously with the plan not for individual survival but to preserve and propagate the species. It would appear that much of the Lord's plan revolves around the need to multiply and have seed, and families, and that this rainbow was as much a token of that as it was a reminder that there would be no such flood again. How clever of Satan then to distort that token in today's world to stand for a lifestyle that is in direct conflict with that eternal commandment to multiply and have seed. The Lord also makes it clear that the rainbow placed between the heavens and the earth would be a symbol for those righteous on earth looking upwards and for those in the heavens looking downwards. See JST Genesis 9:21-23; Moses 7:62-64. This is going to be a glorious and very emotional reunion. All of this is part of the great Rainbow Covenant the Lord made with Enoch and Noah and is available to all flesh. "...in any year that the bow should be seen the Lord would not come;...but whenever you see the bow withdrawn, it shall be a token that there shall be famine, pestilence, and great distress among the nations, and that the coming of the Messiah is not far distant." So keep looking out for those rainbows! Once again we see Satan's handiwork. If he cannot convince people they are nothing if worthless mere mortals he will instead flatter their pride and convince them they can overthrow God. If nothing else the story of the flood and the ark teaches us that the way to become AS God is not found in shortcuts. There is no smooth easy path. It comes through testing, through time, through preparation, through faith, through biding the floods of life within our own spiritual arks whether they be our own souls, our homes or the great temples of the latter-days. The times are fast approaching where we find ourselves living "as in the days of Noah". Our world is consumed with violence, and multiplication of the species has been replaced with gratification of the species, in many perverse ways. The world no longer hearkens unto the voice of God or His prophets. The time is close and at hand. We would be advised to ponder the story of Noah closely for his life can be a great example of how to save our own families in the coming days. Great lesson again. Thanks. Would it be possible to link or add the date of the talk of which the quotes in the lessons come from. I would sometimes like to read more about a spesific talk. Keep up the work. Yes you are right. My mind has been challenging me to be more complete with those links for a few weeks now. Thank you for your timely reminder and let's see if I can be more thorough on that moving forward. Glad you are enjoying the lessons.